the purest bred breed of horses and one of great antiquity. A small (14 to 15 hands high, or 55-60 inches at the wither) riding horse, usually bay, chestnut, white or fleabitten gray in color. It has been extensively used in the production of other breeds and crossbreds. It and its crossbreds are noted for the presence amongst them of cerebellar dysplasia, combined immunodeficiency and leukoderma. 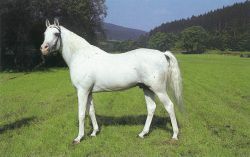 Called also the Arabian horse. With a creaking and rending of breaking wood it collapsed beneath the Arabs, leaving Tarzan, Abdul, and the girl alone upon the frail platform at the top. Alone he could have sprung into the midst of that close-packed mob, and, laying about him after the fashion of Numa, the lion, have struck the Arabs with such consternation that escape would have been easy. Muscat: Mohammed bin Al Zubair, Advisor to His Majesty the Sultan for Economic Planning Affairs, received a gold medal as a pioneer of Arab photography specialised in natural images in the Sultanate. This came as HRH Prime Minister today received at Qudaibiya Palace Arab League Secretary-General Ahmed Abul Gheit, where a number of Arab, regional and international issues were discussed. The Arab leaders also stressed their commitment to work on establishing the best relations among the Arab countries by narrowing the gaps and assert that the Arab-Arab ties are based on the Arab solidarity foundation as the best way for achieving the ambition of the Arab peoples. The Annual Meeting of Arab Financial Institutions will be attended by Arab Fund for Economic and Social Development, Arab Monetary Fund and Arab Investment and Export Credit Guarantee, Arab Authority for Agricultural Investment and Development, Arab Bank for Economic Development in Africa along with the participation of Their Excellencies the Ministers of Finance and Central Bank Governors as well as general directors of Arab finance institutions and a number of regional and international observers and delegates, as the meetings are expected to have over 300 attendees. The Annual Meeting of Arab Financial Institutions will be attended by representatives of Arab Fund for Economic and Social Development, Arab Monetary Fund and Arab Investment and Export Credit Guarantee, Arab Authority for Agricultural Investment and Development, Arab Bank for Economic Development in Africa along with the participation of Their Excellencies the Ministers of Finance and Central Bank Governors as well as general directors of Arab finance institutions and a number of regional and international observers and delegates, as the meetings are expected to have over 300 attendees. Foreign Minister Shaikh Khalid bin Ahmed Al Khalifa and Finance Minister and Minister in charge of Oil and Gas Affairs Shaikh Ahmed bin Mohammed Al Khalifa will take part in the joint Arab Foreign and Finance Ministers' Meeting today to in prepare for the third Arab Economic and Social Development Summit which will take place in Riyadh on Monday and Tuesday. The idea that Qatar is making its move now to assert a leadership role in the Arab world strikes me as exaggerated. Minister of Industry and Trade Hani Mulki who is heading Jordan's delegation to the meeting , stressed the importance of the session as it boosts Arab efforts to activate the concept of Arab economic cooperation and meet the needs of the region. Ambassador Ahmad's remarks came during the 136th Arab League regular session which started on Sunday and lasts until Tuesday ahead of an Arab ministerial meeting. Egypt is honoured to host the second Economic Arab Summit in Sharm el-Sheikh, to carry on with development schemes and follow up on decisions taken in the first Economic Summit in Kuwait," Sayed el-Bouss, an advisor to Minister of Trade and Industry, Rashid Mohamed Rashid, told a meeting of Arab officials in preparation for Wednesday's summit.